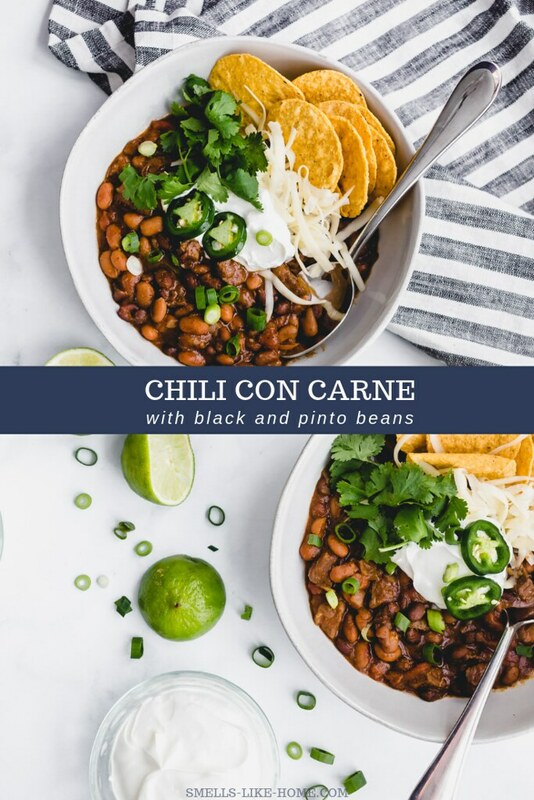 Chili Con Carne with Black and Pinto Beans: A thick and hearty chili loaded up with chunks of beef and 2 kinds of beans. So very unTexas-like and perfect for lazy weekend cooking! As we hunker down in the middle of the winter, I’m always on the hunt for warm and cozy meals. A few years ago, I pulled together a really great list of cozy weekend meals to make when you have extra time to prep and cook a delicious meal. They’re not quick meals like my weeknight meals are. They require a fair amount of time to simmer, braise, or stew in the crock pot. You know, perfect lazy weekend meals! This chili con carne with black and pinto beans is another one of those perfect lazy weekend meals. Prep time is MINIMAL. Seriously, you need 10 minutes to chop an onion and cut the beef into small cubes. EASY. Then you have about 10 minutes of active cooking to do to brown the beef and cook the onions. And lastly, you’ll dump everything else into the pot, bring it to a boil, lower the heat, and let it cook for like 2 hours. Give or take. While the chili cooks, you’ll have plenty of time to do whatever you want. Or if you’re like me, whatever your kid wants you to do. Pretend making and eating eggs/soup/cereal/etc. from a cup with a play spatula? I’m down. Sesame Street? Sure! You get my point. Those 2 hours are YOURS. Make the most of it! Now, let’s talk about the name of this chili for a minute. I called it chili con carne. Translated, that is simply beef chili. I could have called this recipe beef chili but I have 2 other beef chili recipes on the site (classic slow cooker beef chili and black bean and beef chili). Why beat a dead horse, you know? Since I opted to use chunks of beef chuck instead of ground beef, I felt like this recipe needed a “heartier” name. Chili con carne definitely sounds like a heartier meal than beef chili does, doesn’t it?? lol! 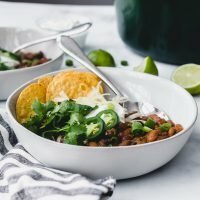 Is Real Chili Made With Beans? The short answer to this question is YES. The long answer is YES but only if you don’t live in Texas. I also considered calling this recipe Texas chili. This was for no other reason than I had seen a Texas chili recipe in a newspaper like 15 years ago that called for cubes of beef instead of ground beef. And for whatever reason, I had it stuck in my head all these years that Texas chili wasn’t made with ground beef, but cubed beef instead. Turns out I’ve been wrong about this. Good thing I did a little research on what a “real” Texas chili recipe is made with too. Because hi! It’s not made with beans! Did you know this? What is that bit of craziness all about? I seriously couldn’t imagine eating chili without beans. Because then what are you eating? Seasoned beef with peppers and tomatoes? That just sounds like tacos to me! And don’t get me wrong! You guys know how much I love my tacos but to me (and most of the rest of this country), chili NEEDS beans. That said, I wasn’t willing to risk baiting the internet trolls with claims of this delicious Texas chili with black and pinto beans. It’s just not worth it. So. On the subject of beans, there are 2 types in my recipe: black beans and pinto beans. I love them both dearly. And I felt like pinto beans definitely should be included in a chili recipe made with chunky beef. It just made sense to me. 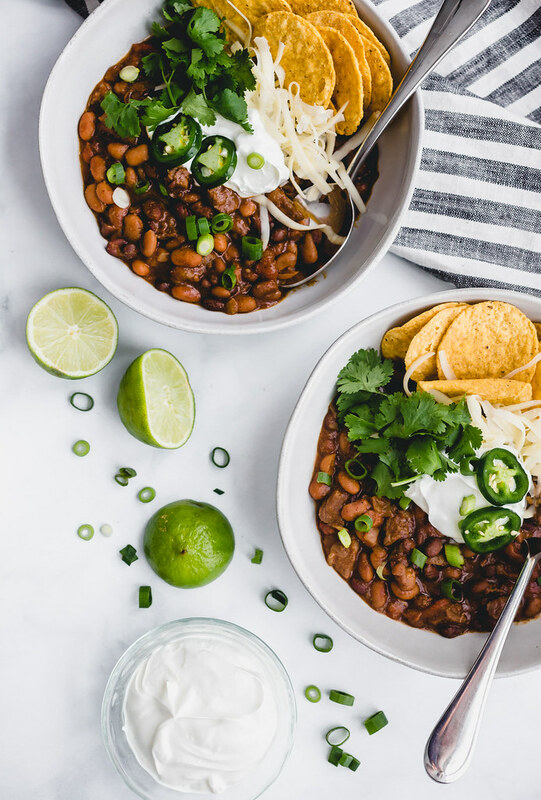 If you want to use kidney beans or white beans – or any combination of beans – in place of the black and/or pinto beans, go for it! 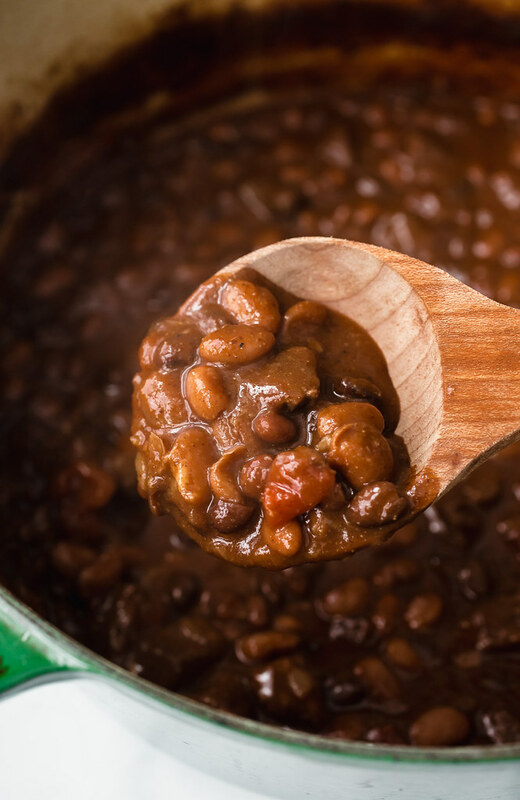 For this recipe, you’ll need 3 15-oz cans, or about 4 ½ cups of cooked beans if you would rather start with dried beans. After its 2 hour stewing period, what starts as a fairly tough cut of beef, turns into tender pieces of perfectly flavored meat. There’s a fair amount of ground cumin in this recipe but it’s not overpowering and all of the spices combine into a Tex-Mex flavor lover’s dream. And the beans! Those infamous beans! They soften during that long cook and pick up all of those beautiful flavors from the chili. 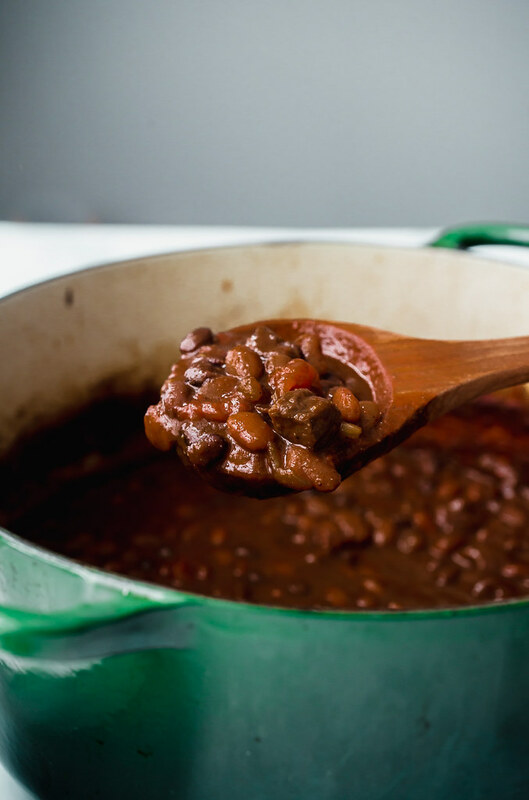 The beans are just where they were meant to be: mingled into a delicious and hearty beef chili recipe. 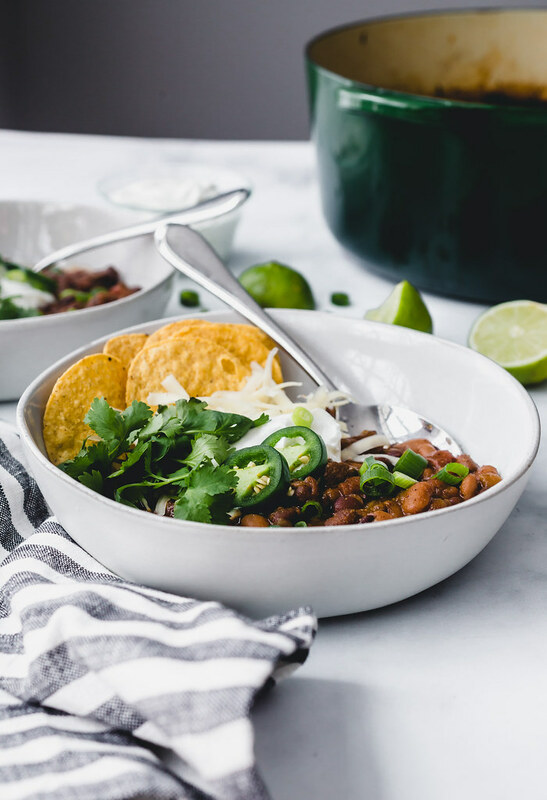 We ate this chili con carne with black and pinto beans with some jalapeño cheddar biscuits which were the perfect dipping vessel for this chili. But other amazing additions to this chili con carne would be my jalapeño cheddar cornbread, these cheddar scallion corn muffins, or this chile cheese bread. You positively cannot go wrong with any of those recipes! The 3 of us – yes, 18-month old Riley too – absolutely loved this recipe! It’s the one I’ve been meaning to make for the past 15 years and I am wholeheartedly happy with how it turned out. I think you will be too. 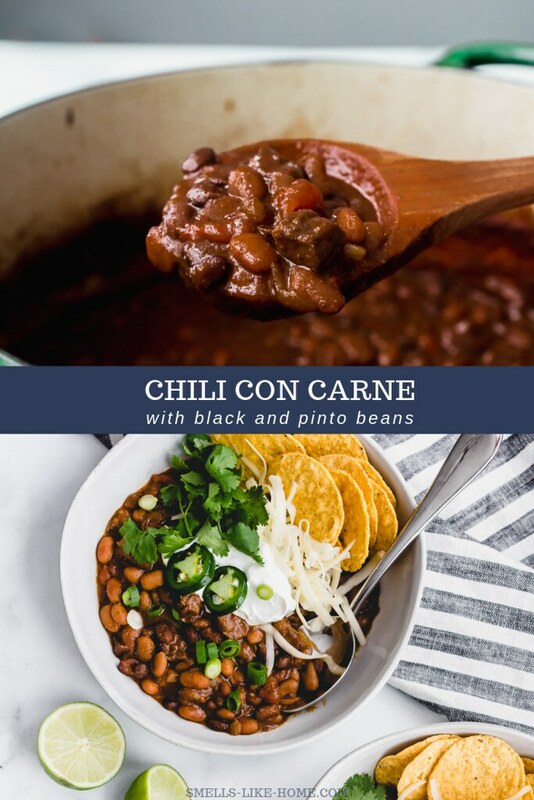 This is a thick and hearty chili loaded up with chunks of beef and 2 kinds of beans. So very unTexas-like and perfect for lazy weekend cooking! Heat oil in a large Dutch oven over medium-high heat. Sprinkle the beef with salt and pepper and add it to the pan. Cook to brown on all sides, about 4-5 minutes. If there is a lot of fat in the bottom of the pot, drain some of it off, leaving just 1 or 2 tablespoons. Add the diced onions and a good pinch of salt and pepper, and cook for 5 minutes, stirring occasionally. Stir in the tomato paste, cumin, chile powder, coriander, and brown sugar until the beef and onions are well-coated. Pour the beer and coffee into the pan and stir to combine. The beer will foam up but will settle back down after a couple of minutes. Add the tomatoes and all of the beans with their juices and stir everything up to combine. Bring the chili to a simmer and then lower the heat to low. Partially cover the pot and cook for 1 ½ hours, stirring occasionally. Uncover the pot and cook for another 30 minutes. The chili should be thickened and have reduced by about 1/3. The beef should be really tender. Serve with all of your favorite toppings and enjoy! The I looks delicious, can’t wait to try the recipe.